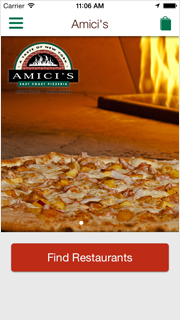 Download our Mobile Ordering App for quick and easy ordering. Save your favorite orders for quick re-ordering, and receive 'App Only' special promotions. Download now and start enjoying your VIP benefits today! Copyright ©2019 Amici's East Coast Pizzeria. All Rights Reserved.